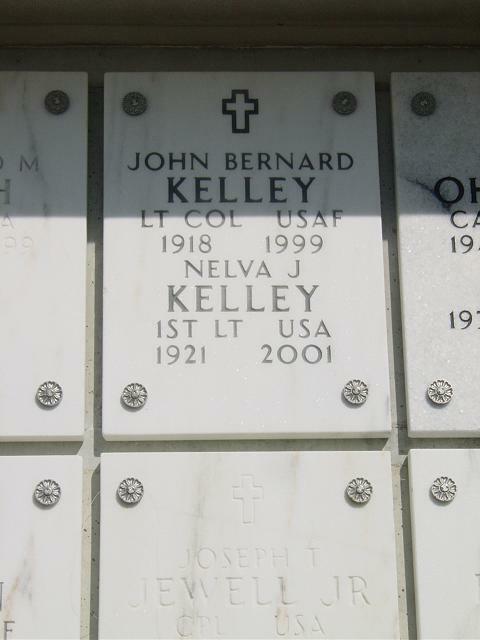 John B. Kelley, 80, a retired Air Force lieutenant colonel who served as a military procurement adviser in the Kennedy and Johnson administrations, died of cancer March 20, 1999, at a hospital in Lawrenceville, Georgia. A former Bethesda resident, he had lived in Duluth, Georgia, for the last three years. In the early 1960s, he was a White House aide who helped devise new military procurement policies. He worked at the White House after a 20-year military career, which began in 1942 when he entered the Army Air Corps. While in the Air Force, Colonel Kelley, a Massachusetts native, graduated from the University of Maryland and received an MBA from George Washington University. After leaving the White House in 1964, he worked for about 20 years as lobbyist for what was then Avco Corp., garnering support for projects including Head Start and the M-1 battle tank. Survivors include his wife of 53 years, Nelva Jane Culbertson Kelley of Duluth; five children, Michael Kelley of Columbia, Kevin Kelley of Boulder, Colo., Kerry Hunter of Charlotte, Patrice Pittman of Fulton and Tracey Buck of Alpharetta, Ga.; and 16 grandchildren. Of Duluth, GA and Bethesda, MD died Saturday, March 20, 1999. He is survived by his wife of 53 years, Nelva Jane Culbertson Kelley; their five children, Michael Kelley, Kevin Kelley, Kerry Hunter, Patrice Pittman and Tracey Buck and 16 grandchildren. Funeral services will be held on Thursday, April 14, 1999 at 10:45 a.m. at Arlington National Cemetery.